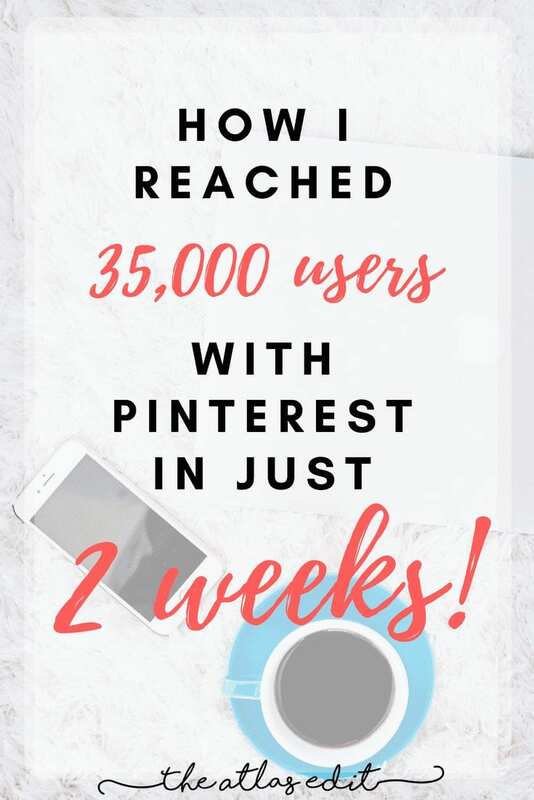 How I Reached 35,000 Users on Pinterest in Just 2 Weeks | The Atlas Edit. So you want to increase traffic to your site, but just have no idea where to start. I was in exactly the same boat as you, until I found this magical unicorn/mermaid app called Tailwind. Tailwind is a Pinterest auto-scheduler that determines the best times for pins to be published. And we all know that Pinterest is one of the biggest sources of traffic for blogs, right? And if you’ve tried your hand at pinning, you’ll know how time-consuming it can be, especially if you’ll need to be pinning about 50 pins per day to get any kind of traction. 50 pins PER DAY. That’s probably about an hour out of your day that you could be spending on writing quality content on your blog! With Tailwind, all you need to do is spend one hour PER MONTH, and you’ll have all your pins scheduled to go out for the rest of the month! I can’t even begin to explain how awesome this tool is. I saw this Tailwind app being promoted by almost every blog I read, and was a little skeptical at first, just like you may be now. My blog was new and budget was limited so I couldn’t justify paying for a service I was unsure about. That’s the best thing about Tailwind, is that it offers users one-month free trial so you can test it out to see if it works for you. No risks, no commitment. So that’s why I took the plunge. But when I saw the numbers, I was in shock. And numbers don’t lie. I WANT MY TAILWIND FREE TRIAL! I’ve only been using Tailwind for less than 2 weeks, and the results are staggering. I’ve had a Pinterest account for a few years now but never used it professionally until 2 weeks ago. I then found another blog that was offering another $15 off the PLUS plan, and reactivated Tailwind on March 10. Immediately you see the graph pick up again! Magic, people. So this is where the magic happens. The bigger the audience you reach, of course the more exposure your pins will have, and thus more traffic to your blog. Again, you can see here how the numbers jump from less than 1000 viewers to 5000 viewers in a matter of days, with an average growth of almost 8000%. That’s crazy!!! I’ve only been blogging for 2 weeks, and already have a reach of over 32k users! I switched off Tailwind on March 4, and you can see the gradient lessening, but then it picked up again on March 10 when I reactivated it. The effects of Tailwind are even more obvious here. Again, the flatline until Feb 27th and you see a dramatic increase from then until I deactivated Tailwind on March 4, and boom! The daily impressions took a huge nosedive. And then upon reactivation on March 10, you can see it pick up again. So it’s really evident that Tailwind has a huge impact on traffic and exposure. Bear in mind I’ve only been using this for less than 2 weeks and my blog has only been live for about the same amount of time, and I’m already seeing drastic results. Another special thing about Tailwind is its “Tailwind Tribes”, and this is where your reach grows extremely quickly. A tribe is a group of people who collaborate and pin on a particular topic. They’re similar to group boards, except they’re so much easier to join. No more hunting around for emails to request to be added to a group board. You’re just a click away from a tribe with a reach of 1 million. Yup, it’s possible. So once you join a tribe, and pin to that tribe, tribe members can then re-pin your pin to their own followers. And if one person with 5000 followers repin your pin, you’ll get an extra reach. Multiply that by 5 tribe members who repin your pin. Mind-blowing! How many times did I say pin? These were my results from just pinning 5 pins on my tribes in a matter of 1 week. My reach grew to more than 1/4 of a million users! That’s insane. Get your Tailwind Free Trial! So if you wanna get serious with your blog or site, I’d definitely recommend Tailwind 1million% because you see results almost instantly AND it’s a huge time-saver. If you haven’t already tried it, sign up here for your free Tailwind trial. No credit card needed. Just sign up, link your Pinterest account, start pinning and sit back and watch your numbers grow! No obligations and no commitments if you don’t like it (but why wouldn’t you?). I’ve heard nothing but great things about Tailwind and have no clue why I haven’t tried it yet! I really need some help with traffic to my blog so I’m going to finally try it out this week! Great explanation of how it all works, too! Yup, Tailwind is awesome with getting traffic! Hope this helped 🙂 and good luck with your blog traffic! I didn’t realize their was a free trial! I am going to keep learning for a few days and then come back here to try. I don’t get it–where do those 50 pins go when you pin them? Don’t they have to go to a specific board? Bear with me, brand new Pinterest user here! Wow that’s awesome! I am a new blogger and I keep putting off Tailwind, because honestly it confuses me lol, but I might just have to take the jump! Thank you for the info. All this time I’ve been spending so much time on Pinterest not knowing about Tailwind. I will need to do more research on this and will come back for this trial. Great post by the way. Yeah you should just jump into it since its a free trial and you have nothing to lose anyway. i just had to share cause it really worked for me 🙂 Thanks for reading! Awesome job explaining. I will definitely give this a try. Once I figure out how to use Pinterest for business I will look into this! Thanks for reading Jenna! yes it’s great! Such a time saver. Wow! This is awesome. I haven’t even started using Pinterest for my blog yet (despite knowing it’s supposed to be the best traffic source) because of the time involved…. But this might make me reconsider!! Yes, Pinterest is probably THE social media to focus on if you wanna drive traffic. And Tailwind is really time-efficient too! I just set my pins last Monday and haven’t touched pinning since! What awesome results!! I might need to pick your brain! I’m kind of clueless too! Hey Sarah, happy to help anytime! This was probably the most simple explanation of tailwind i’ve read. Thank you for keeping it short and sweet because every post I read on it, I honestly leave because it’s too long and full of fluff. but now I’m signing up for my free trial!!! Thank you! Aww thanks Katie! I think the results speak for themselves so I didn’t need to add in too much fluff haha. Hope you enjoy Tailwind!! Great post! I absolutely love tailwind for the reoccurring posts and for new blog posts that go up 3x per week. I still manually pin and I’ve seen awesome results with the combo of the two. Thanks! I have yet to try the combo but I will once I have more time to commit to Pinterest 🙂 Right now, Tailwind is great since I’m juggling so many things at once! I can not agree with you more. Tailwind is supreme and I highly recommend it. The tribes are amazing! That’s awesome! You just need to invest a little bit of time every month on Tailwind and you’re good to go for the rest of the month! I love Tailwind! It’s one of my favourite blogging tools ever! I love it even to find other people’s content to post too! Yeah it’s great! I’m a huge fan! Just signed up for tailwind and still a bit skeptical. I think I really need to jump in and actually use it to schedule all my pins instead of just using it for a few. I just started using Tailwind. This was helpful on how I can be utilizing Tailwind better. Thanks!! Thanks for reading Cassie! There are so many awesome ways to use Tailwind to serve you better. I love Tailwind Tribes! Wow! I have been wanting more traffic to my Pinterest and always wondered how. I am going to give this a try! Wow! This is impressive! I want to try Tailwind too but as of now, I am still in the process of writing more contents. So that by the time I use this app, I already have more contents to be shared. Thank you for the tips. Hey Sharon, good strategy! Tailwind will be here when you are ready, and don’t forget to sign up for the free trial 🙂 Good luck with your blog! Hey Maninder! It sure is gonna change your life 😉 Have fun with Tailwind!